Scorpions tend to be nocturnal creatures, feeling vulnerable in the daylight. When exposed to ultraviolet, or UV, light at night, their exoskeletons glow, but scientists aren't exactly sure why. Several theories exist, but a couple of studies have scientists leaning toward the glow serving as a way to help scorpions find shelter in their dark environments. Ultraviolet light is normally associated with daylight. It's the light from the sun that causes you to tan -- the light that sunscreen typically blocks. The moon doesn't produce light of its own. Instead, it reflects the light from the sun back toward Earth, including some very mild UV rays. These aren't enough to tan your skin, but they can make scorpions glow. Their glowing bodies might serve as one big eye, helping scorpions find shelter under rocks, logs or grasses on moonlit nights, according to a 2012 study published in "Animal Behaviour." 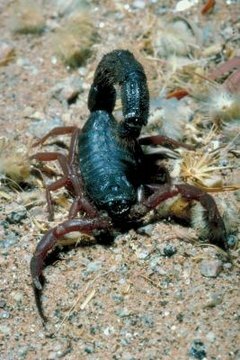 Led by Douglas Gaffin from the University of Oklahoma, this study showed that scorpions would scurry around in the dark until part of their bodies fell under the shadow of shelter. When shelter was scarce, scorpions preferred even a single blade of grass that cast just a small shadow to sitting completely exposed in the moonlight. This might be because the glowing exoskeleton helps the scorpions see by passing information to the brain on the amount of glow; when the exoskeleton glows more, the scorpion is in greater danger of predation. When there's no glow, the scorpion is sheltered from predators. Scorpions don't have the best eyesight. They see mostly in the blue-green spectrum. In 2011, Carl Kloock of California State University began leading research on why scorpions glow. His research leads scientists to believe the glow might be an adaptation that allows scorpions to know when they've found safe shelter. Kloock studied the behavior of scorpions who could glow and those who had lost the ability. The glowing ones found shelter in the dark quickly, while those who couldn't glow tended to roam more. The exact reason for glowing isn't completely understood, but the science behind the glow is. Young scorpions and those who have newly molted don't glow; they develop the fluorescence as their exoskeletons harden. The exoskeleton develops several chemicals, including beta-carboline, that cause it to glow under UV light. They lose this ability temporarily when they shed their skins, but gradually regain it after their molts. Indiana Public Media: Moon Tanning? NBC News: Glow-In-the-Dark Scorpions -- How Do They Do It? Discover: Why Do Scorpions Glow in the Dark (and Could Their Whole Bodies Be One Big Eye)?